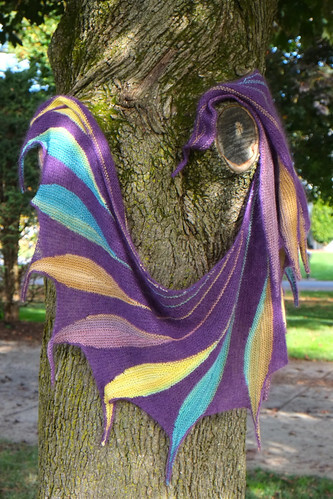 Seems like my posts are getting heavy on shawls. Not to break the habit, here comes another one. I finished my Dreambird. I’ve been eyeing the pattern for a while and decided to go for it right before our road trip this summer. Shawl and car ride seem like a good combination. If I were smarter I would actually finish the first feather before setting on the road. The instructions were way to wordy and lengthy to attempt in the car. That poor shawl (or rather wound balls of yarn) drove with me some 6,000 miles across the United States, then flew with me to Europe, drove another 2,000 miles on our European vacation only to fly back to US without much progress being made. In Spring we made a trip to NYC. I made my family follow me to Lion Brand Studio, where I got two balls of their LB Mohair Silk yarn. That’s what I used for the main color. For the feathers I spun FatCatKnits Merino Bamboo blend in Buster colorway. After finishing the first feather, I found it very useful to use only the page with number of stitches for each row (pg. 16). That was I did not need to read through pages of explanations, everything was neatly on one page. My husband commented it looked like some secret code. I am rather pleased with the result. The two balls of Mohair Silk were enough for “only” 17 feathers. But the shawl is plenty big. Mini Bubbles, a photo by kpetra on Flickr. Summer is technically over, kids are back to school and I am trying to get back to the swing of things. Tami’s amis is hosting FO Fridays and this is my attempt to be part of it. We had a great summer, went on a cross country road trip and then spend half of the summer in Europe. I have a tendency to overpack my knitting and spinning supplies (forget the clothes as long as mommy has something to keep her hands busy) and as usual I did not disappoint. I did a quick math, well over 60 hours spent in the car driving should push me well into FO territory on a good number of the projects. Yeah. Not so true. I did not account for my share of driving, planning the route, demands of the kids and such. At least my Mini Bubbles got well under way. I continued working on it in Europe, brought it back and finally finished last week. 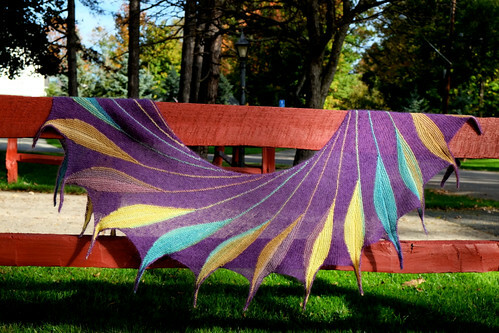 It’s a fun shawl pattern by Kieran Foley using dropped stitches. I used my handspun in Gale’s Art colorway Scarab and Coctail on variegated BFL. It is spun as singles, slightly fulled. The finished yarn is slightly fuzzy, which made dropping the stitches major pain. Instead of goind “whoosh” and dropping the full column in no time, I had to manually go stitch by stitch and undo them. I love the final effect though. 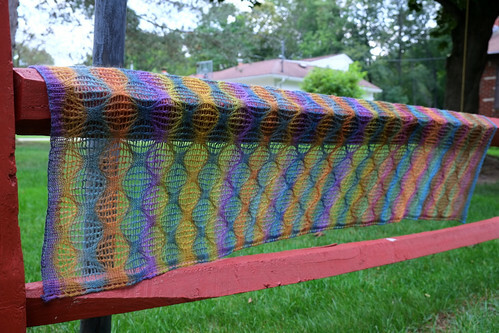 Now hop over to tami’s amis to see what others have finished this week. moxie, a photo by kpetra on Flickr. When I saw this colorway for the first time I was sure to skip it. Then my girls got involved and begged for it. Since I don’t need much persuasion to get more fiber I gave in. Well, planning is good, but doesn’t always work. Over (very short) time, my spinning got so thin I was afraid my yarn would not be thick enough for socks. Yeah, wishful thinking in this case. 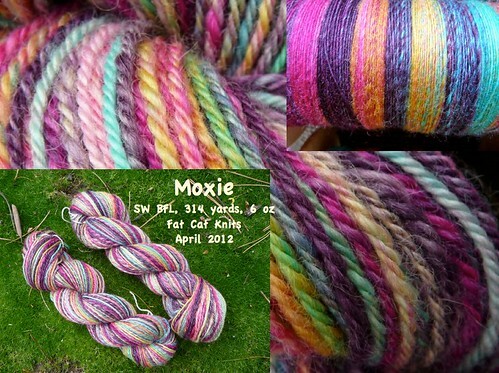 I paid so much attention to spinning decently thick singles that I ended up with about worsted weight yarn. Time to redo my plans. Legwarmers would still work, but might be too warm to wear in school all day long. Soooooo, since winter made its comeback today (it’s snowing and snowing on April 23), I am in mood for some mittens. I am thinking flip tops. That should make the girls excited enough to forget my failed promise of socks.